Make healthy food choices, drink lots of water, move your body... the recipe for maintaining a healthy weight seems simple enough. Even though the human body is a complicated mess of glands, veins, and social constructs, avoiding excessive weight gain is pretty straightforward. So what's going on if you eat the same foods every day (provided those foods aren't exclusively bacon and donuts) and still notice the scale creeping up? When you think you're doing all the right things without seeing results, there may be underlying forces working against you. You may think that gaining weight is a sign of radically changed habits, sucking down soda at every opportunity, eating dessert after every meal, swapping baby carrots for potato chips. That's not entirely wrong. 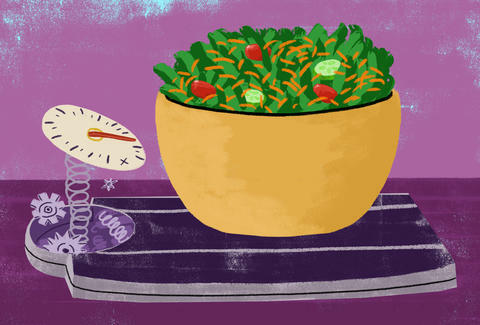 "At the end of the day no matter what, you can only gain weight if your calorie intake is greater than your calorie expenditure," Dr. Eduardo Grunvald, program director at UC San Diego's Weight Management Program, says. "If you assume that your calorie intake hasn't changed, that means your energy expenditure has to have gone down." Obviously, if you eat more calories, you're going to gain weight. But how your body processes those calories is also a factor; your body burns energy just staying alive during day-to-day physiological processes. There are a lot of things going on that could change how efficiently your body uses its fuel. Like death, taxes, and cliches, aging is one thing in life that's guaranteed. Along with gray hair and aching joints, you can also look forward to packing on the pounds. "Your metabolic rate goes down as you age," Dr. Grunvald says. "Your peak metabolic rate is kind of around your late 20s, maybe 30, around there. After that, it's downhill." "As we age, we naturally lose lean muscle mass at a rate of 1% per year starting around age 30, and that accelerates starting around age 40," says Dr. Caroline Apovian, director of Nutrition and Weight Management at Boston Medical Center. So your metabolism slows down, and you lose lean muscle mass?! The two go hand-in-hand, she explains, as having more lean muscle mass means you'll have a faster metabolism. So if you're eating the exact same calories now as you did in your early 20s, you could still be putting on weight. It would seem counterproductive that a medicine supposed to keep you healthy would make you gain weight, which is decidedly unhealthy. Unfortunately, this is a common side effect of a number of medications. The biggest culprit are psychotropic medications, especially the antipsychotics used to treat severe mental illness such as bipolar disorder and schizophrenia, according to Dr. Grunvald. Antidepressants and anti-seizure meds are also commonly associated with weight gain, although not as much as antipsychotics. In some cases, people gain weight on beta-blockers to treat blood pressure and heart rate. And while there are new drugs for diabetes that don't have this effect, Dr. Grunvald says older diabetes medications, including insulin, could cause people to gain weight. Getting seven to eight hours of a sleep a night may be a pipe dream for some, but it's essential for overall health. One major downside of not sleeping enough? You're not going to believe this: weight gain. "When we do not sleep enough, our hunger hormones will be high the following day and our impulse control will be lower," Dr. Apovian says. "In addition, a lack of sleep over the long term interferes with the metabolism and erodes our lean muscle mass." Basically, lack of sleep affects your body the same way aging does; that's why you feel like a cranky old man after only a couple hours of shut-eye. Not enough sleep also leads to junk-food cravings and makes you worthless at the gym, so there are other associated reasons why you need to make sure you get enough Zzz's. Blaming your thyroid for weight gain may sound like a BS excuse that no one can challenge, because most people don't know what the thyroid actually does, and it can be comforting to attribute your gut to a mysterious gland gone haywire. While it's not as common as people may think (or hope), thyroid conditions can certainly be a factor in weight gain. Your thyroid controls your metabolism, so when it's working slower than normal (hypothyroidism), it will inevitably lead to weight gain. "Unexplained weight gain is one symptom of this condition," Dr. Apovian says. "Other symptoms of hypothyroidism include fatigue, constipation, feeling physically weak, sensitivity to the cold, and puffiness of the face." If you're noticing these symptoms, visit your doctor for a simple blood test to be sure. As much as you can keep your weight in control with lifestyle choices like diet and exercise, you still could be predisposed to obesity, thanks to the wonders of your genetic makeup. If your mom started to rapidly gain weight around age 25, for example, and you notice the same thing happening to you, Dr. Grunvald says you may be SOL. Thanks, mom! It's rare, but there have also been cases where a specific gene mutation could be the cause of weight gain, he adds. This is even more prevalent if someone was obese as a young child -- before the age of 6 -- and the weight gain could start to manifest itself again as you get older. Ultimately, putting on unwanted pounds has more to do with lifestyle factors than anything else. But if you start to notice a rapid change in your weight and everything else has stayed relatively the same, you may want to visit your doctor to make sure there aren't hidden causes that are messing with that number on the scale. Christina Stiehl is a Health and fitness staff writer for Thrillist. She's taking this as a cue to sleep in more. Follow her on Twitter @ChristinaStiehl.